Q1 2019 Reports: How’s the Market? Be forewarned, this quarter’s report looks somewhat dismal. There are two very relevant facts that should be taken into consideration when reviewing it. 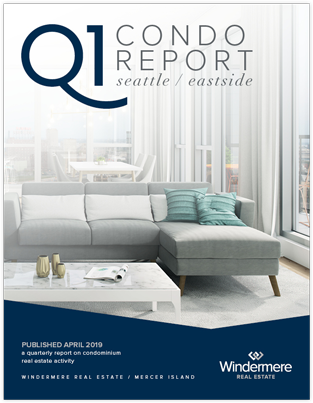 The first is that Q1 is nearly always the worst performing quarter of any year because the sales completed in Q1 typically went under contract between late November and the end of February—a notably quieter time of year in our seasonal Seattle market. The second aspect to consider is that Q1 of 2018 was an atypically strong quarter and likely marked the peak of the current real estate cycle as buyers approach this year’s spring market with cautious optimism rather than the reckless abandon that we witnessed in the first four months of last year. Since then, mortgage interest rates rose in November to a seven-year high of 4.87% and then subsequently came down to 4.27% in March—creating enough of a stir to get buyers attention. Each 1% increase in mortgage interest rate is equivalent to a 10% increase in home price. Conversely, a half point drop in the rate is comparable to a 5% price reduction. 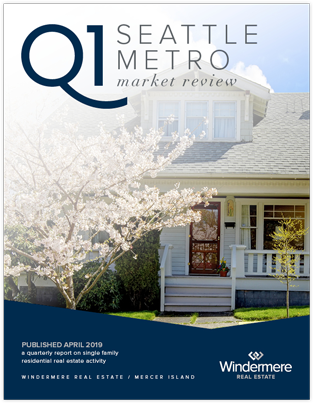 Sellers and buyers are beginning the second quarter on more equal footing than they’ve had since the late 1990’s as we’ve rapidly oscillated between a seller’s market, a buyer’s market, and then a seller’s market again with little breathing room in between. Sellers have enjoyed a seven-year run with double digit annual appreciation most of those years. Buyers have enjoyed record setting low interest rates and can purchase today at what amounts to roughly 60% of the monthly expense of the forty-seven-year average 8.09% mortgage interest rate. The market has much to offer buyers and sellers this year. We believe those looking to make a move in the next few years should do so this year when they can still secure incredibly affordable mortgage financing. Today’s buyers should be prepared to stay in their home at least five years. Home sellers moving to lower cost regions may also benefit from selling now. We know that every situation is unique, and we are here to help you evaluate your personal real estate holdings and purchase strategy. The number of homes for sale more than doubled in Q1 compared to one year ago giving buyers options and compelling sellers to put their best foot forward. Seattle’s overall Median Sale Price was down 5.8% from Q1 2018 to $725,000 and down 1.4% from Q4. The Average $ Per Square Foot was down 1.6% from Q1 last year to $422. Queen Anne-Magnolia and North Seattle were the most impacted markets with the largest decrease in median price. As disappointing as the numbers are, Seattle homeowners have seen a 60% increase in the Median Sale Price over the past five years. Click here to view the complete report for a neighborhood by neighborhood breakdown of Average Sale Price, size, and number of homes sold. Continued employment growth and planned expansion on the Eastside have benefitted homeowners as compared to Seattle as Bellevue, Redmond and Kirkland prepare for unprecedented development in the next decade. 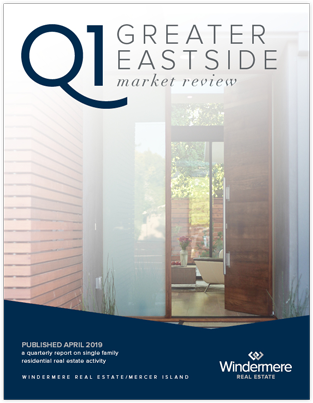 The Eastside’s Median Sale Price was down 1.8% from Q1 2018 to $927,000, but up 3.9% from Q4. The five-year Eastside median price trend is up 53% over 2014. East Bellevue, East of Lake Sammamish, and Woodinville performed best in Q1—all with median price increases rather than reductions. A total of 1,209 home sales closed in Q1, which was down significantly from Q4, but down only slightly from the robust Q1 2018. Click here for the full report and neighborhood-by-neighborhood statistics! 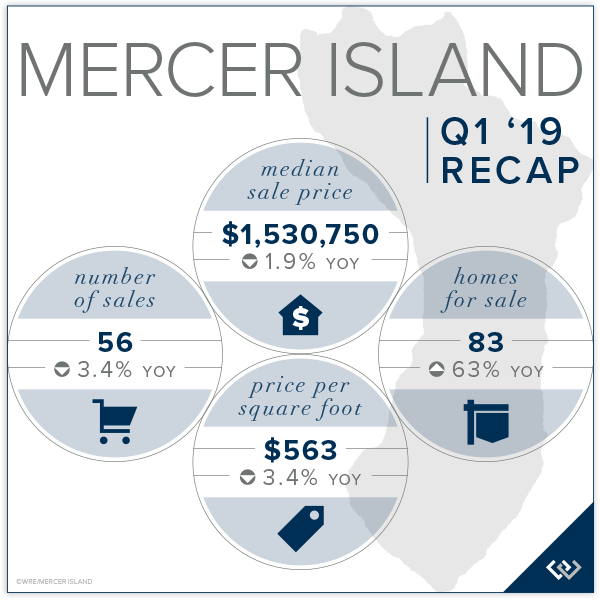 Following a 10% Median Sale Price increase in 2018, the Mercer Island median fell 1.9% in Q1 2019 from Q1 2018 and 10.9% from Q4. Fewer luxury sales—only one waterfront sold in Q1—and lower demand contributed to the off quarter. The lower velocity of luxury sales impacted the Average Sale Price even more so than Realistically priced homes in solid condition and with desirable lot amenities and settings will do well in Q2 as they are met with demand from the greatest segment of buyers. Affordability and access to transportation and amenities continues to drive condo desirability, but a nearly three-fold increase in the number of units for sale and softening apartment rents have tempered demand in some areas. 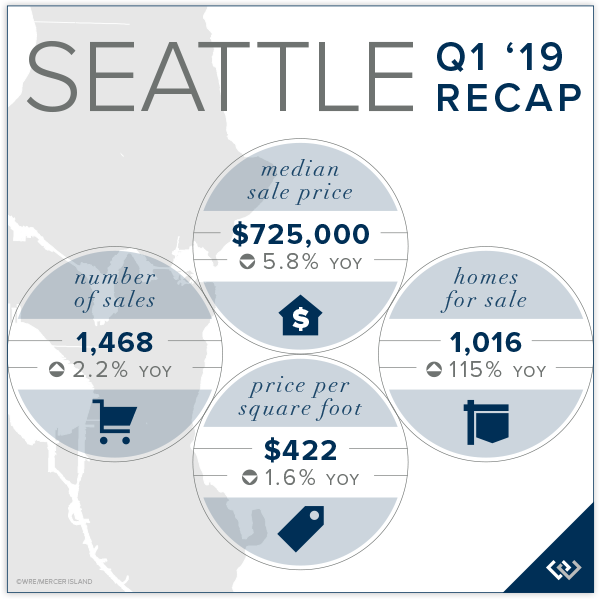 Seattle’s Condo Median Sale Price was down 4% from Q4 and 10.7% from Q1 2018 to $460,000 following a 12.8% median price increase in 2018. The Average $ Per Square Foot was $577. West Seattle and Queen Anne condos fared better than average while condos prices to the north softened a bit more. 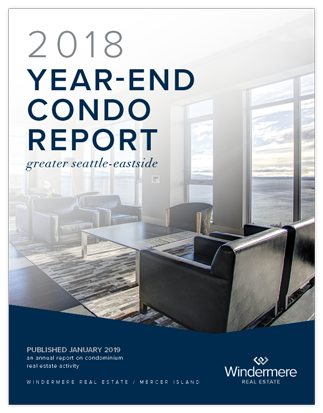 The Eastside’s Condo Median Sale Price was down 5.5% from Q4 and 4.2% from Q1 2018 to $460,000—the same as Seattle—following a 17.2% median price increase in 2018 and a 20.6% increase in 2017. The Average $ Per Square Foot was $431. 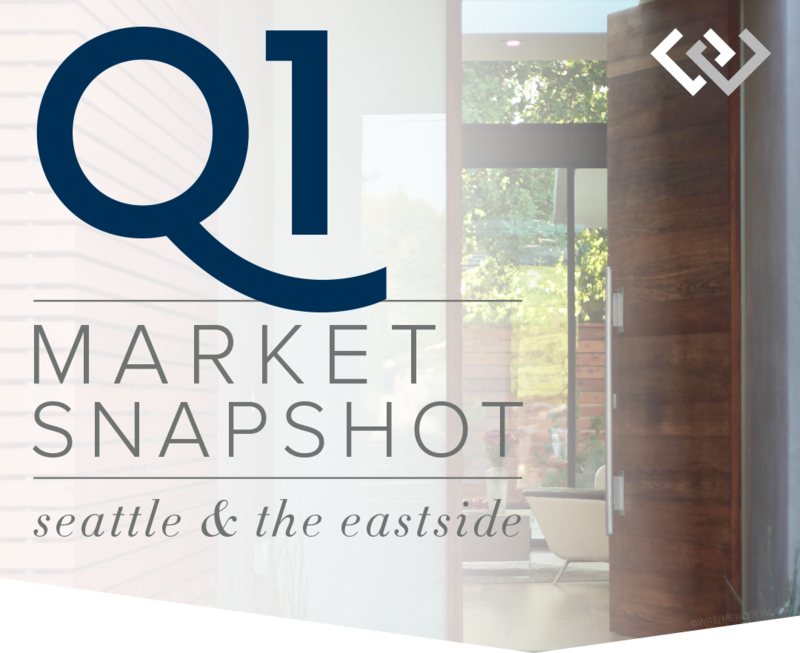 South Eastside and Mercer Island condos performed better than average while Kirkland condos struggled in Q1. Check out all of these factoids and more in the full condo report. The Eastside had more private waterfront activity than Seattle, Mercer Island & Lake Sammamish combined. 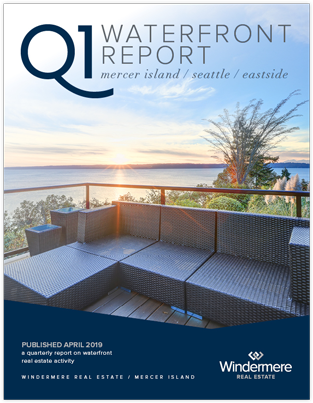 Seattle and Mercer Island sales were far slower than typical in Q1 with only two sales in Seattle and one sale on Mercer Island reported to NWMLS. 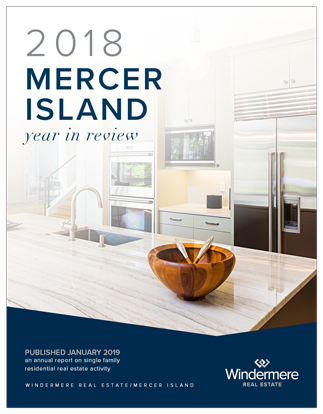 Mercer Island had eight Q1 sales in 2017 and five in 2018. 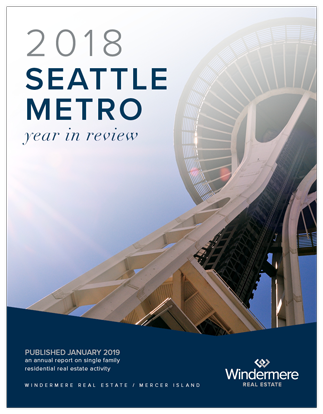 Seattle had six Q1 sales in 2017 and 3 in 2018. The highest Q1 sale was a 1963 Yarrow Point home on 80 feet of waterfront sold at $8,650,000 after only 5 days on the market. The lowest sale was a 1940 Pleasure Point bungalow in South Bellevue with 45 feet of waterfront for $1,560,000 on the market for 7 days. Waterfront homes sold in Q1 tended to either sell immediately or languish on the market for months with very few finding middle ground. 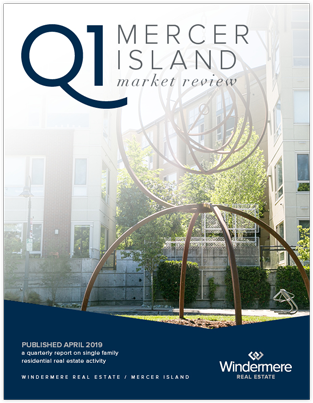 This top-level overview of the entire Seattle-Eastside private waterfront market, including Mercer Island and Lake Sammamish, provides a glance into the trends occurring in our region over time. Interesting, and certainly insightful, it in no way replaces an in-depth analysis on waterfront value provided by a savvy broker with years of local waterfront experience. 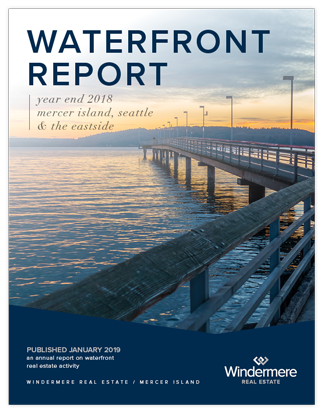 Check out the full Waterfront Report for a complete list of waterfront home sales by address and community. © Copyright 2019, Windermere Real Estate/Mercer Island. Information and statistics derived from Northwest Multiple Listing Service and deemed accurate but not guaranteed. An increase in homes for sale coupled with rising interest rates have created a far more balanced market than we started 2018 with. This is a good thing as it will help our region tame affordability and create a sustainable marketplace. More homes came to market in 2018 than in any year since 2011. This provided home buyers with plentiful choices and forced home sellers to competitively position their homes to compete with other homes for sale—something they haven’t had to give much thought to in the last seven years. The cost of a 30-year fixed-rate mortgage began the year at 3.95% and ended at 4.64%. Indications show rates could rise to 6% by the end of 2019. Mortgage rates are a far bigger factor than most people consider. A 1% increase in mortgage interest rates decreases buying power by 10%. Or said differently, a 1% rate increase has the same net effect on monthly payment as a 10% increase in the sale price. That also means if prices fell 10% but rates went up 1% the monthly mortgage payment would remain the same. Our 2019 market will be driven by buyers motivated to beat interest rate hikes nipping at their heels and by sellers who will choose to price moderately following a seven-year appreciation growth run. Properly-priced homes in good condition and in desirable settings will do well, as will affordable homes on the periphery of the metro region. Strategic positioning, savvy marketing, and expert negotiation have never been so important as they are now. 2018 was a year of transition from an ultra-competitive seller’s market to a more balanced market. The first four months of the year saw dramatic price acceleration—arguably far beyond the comfort of Seattle area home buyers—as home values skyrocketed each month through the spring market. Around the beginning of May, home buying activity slowed as the number of homes for sale increased and buyers had more choices for the first time in years. Home prices have declined since that peak in most neighborhoods, but still ended the year up comfortably over 2017 values. Seattle’s overall Median Sale Price was up 8.8% to $769,950, while its Average Sale Price was up 10.4% to $883,590. The Average $ Per Square Foot increased 9.7% to $437, with Lake Forest Park/Kenmore the most affordable region at $327/sq ft and Madison Park/Capitol Hill the most spendy at $561/sq ft.
Three Seattle neighborhoods had double-digit median price growth in 2018: Lake Forest Park/Kenmore at 14.4%, West Seattle at 12.7%, and Queen Anne/Magnolia at 12.2%. Even with Eastside expansion announcements from several notable tech companies, 2018 saw a shift from an ultra-competitive seller’s market to a more balanced market. While the sky is not falling, price growth has slowed to a more modest and sustainable pace. After rising astronomically at the beginning of the year, prices have generally softened as buyers and sellers find their new norms. 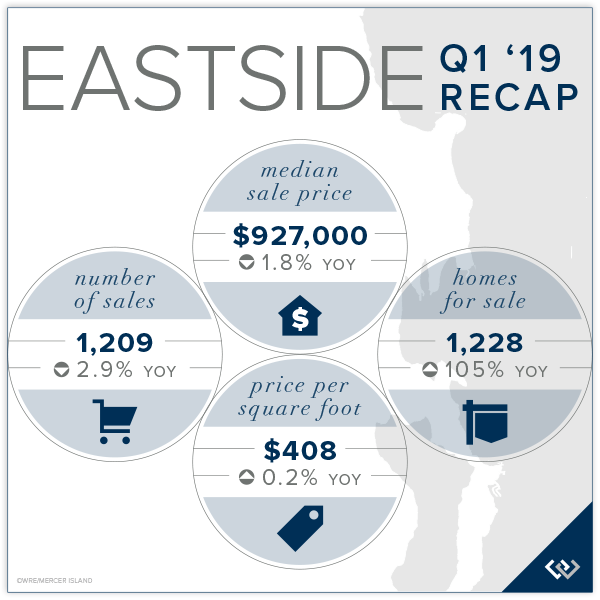 The Eastside’s overall Median Sale Price was up 8.2% to $939,129, while its Average Sale Price was up 9.3% to $1,143,557. The higher average sale price reflects the impact of luxury home prices at the upper end of the market. The median sale price is attributed to the larger volume of mainstream sales at more moderate price points. 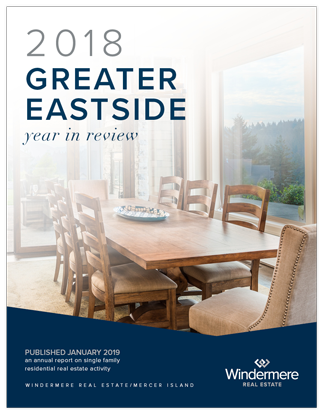 Four Eastside neighborhoods had double-digit median price growth in 2018: Kirkland at 23.8%, Woodinville at 12.9%, West Bellevue at 12.4%, and Mercer Island at 10.0%. The Island, much like the region surrounding it, saw a shift from an ultra-competitive seller’s market to a more balanced market as the number of homes for sale increased markedly following a strong spring market. Home values have softened since the peak market of 2018, but still ended the year with a hefty increase over 2017 values. The number of home sales were down in 2018: 285, as compared to 330 in 2017. Modern, turn-key homes and highly desirable settings were most sought after while those lacking essential attributes were often passed over, ending the year unsold. Uniquely situated near both the Seattle and Eastside metro areas, the Island has always tended to fare better than most in a transitioning market. Mercer Island’s Median Sale Price was up 10.0% to $1,700,000, while its Average Sale Price was up 10.5% to $2,059,996. The higher average sale price reflects the impact of luxury home prices at the upper end of the market. The Average $ Per Square Foot increased 11.3% to $606. New construction added to the more than two-fold increase in the number of condos for sale during the year compared to 2017, from 2,131 to 4,857 units listed throughout the year. Even so, regional affordability issues drove condo desirability to all-time highs and fueled price increases that outpaced single-family homes. Seattle’s Condo Median Sale Price was up 12.8% to $505,500, while its Average Sale Price was up 10.5% to $582,163. The Average $ Per Square Foot increased 7.5% to $601. Three regions saw increases above 20%: Richmond Beach/Shoreline at 26.8%, Ballard/Green Lake at 24.1%, and South Seattle at 24.0%. 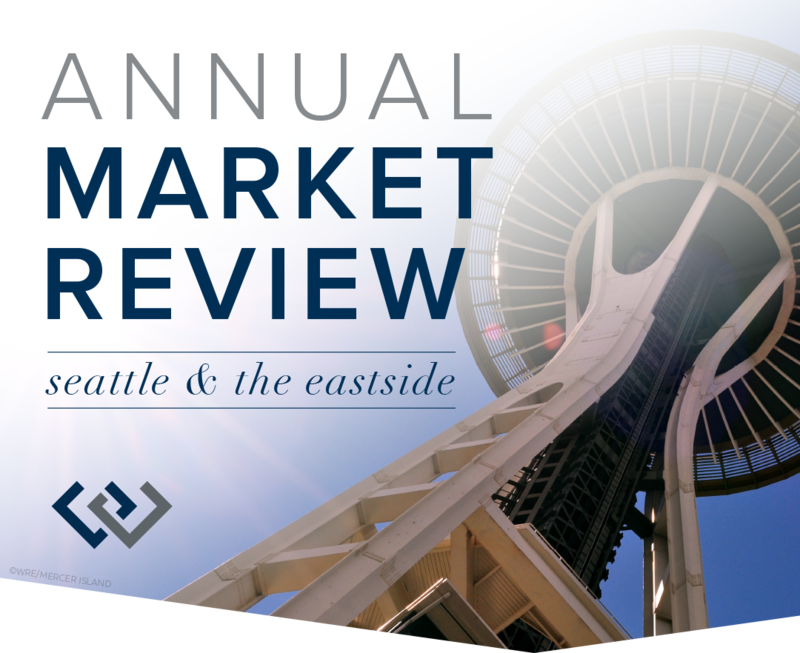 The Eastside’s Condo Median Sale Price was up 17.2% to $480,500, while its Average Sale Price was up 17.0% to $576,061. The Average $ Per Square Foot increased 13.5% to $453. Two regions saw increases above 20%: East Bellevue at 34.0% and Kirkland at 25.0%. While the number of sales in 2018 was down markedly compared to recent years as a result of fewer international buyer purchases, a handful of notable sales drove value markers up, creating the artificial appearance of appreciation when price growth was relatively flat in 2018. Those sales include three Media and Points properties sold above $14 M, a record Lake Sammamish sale above $11 M, a Mercer Island sale above $13 M, and a Laurelhurst sale at $11 M.